In an interview yesterday with KPCC, the Los Angeles area public radio station, San Diego Mayor Bob Filner pulled no punches in criticizing Congress and the Congressional leaders he left behind after 20 years to run for Mayor. The bottom line, the reason he chose to run for mayor instead of returning to Congress for what would have been his 11th term, was the same thing Filner said to SDFP colleague Annie Lane and I when we sat down with the then mayoral candidate back in April for the OB Rag: Congress is a complete, dysfunctional mess. The mantra of shrinking government down to a size “where you can drown it in a bathtub,” as Grover Norquist likes to say, became the overriding principle in the House in 1994 when Newt Gingrich first became Speaker. Since then—and especially since 2010—it’s only gotten worse. It’s hard to accomplish anything in a governing body when one side of the aisle views the principles of compromise as the complete antithesis of good governance. When “my way or the highway” rigidity and a complete rejection of scientific principles is the rule as instituted by the majority. Filner’s right, of course. When one side is stuck negotiating with itself, it’s exceedingly difficult to get anything done. When Barack Obama is stuck sitting across the negotiating table with an orange mannequin incapable of offering anything constructive to the discussion, good governance becomes next to impossible, particularly in a divided government. But Filner didn’t merely reserve his criticism for the Tea Party and the Republican principles they supposedly represent. His own Democratic colleagues were not spared the metaphorical lashing. He criticized the Democratic caucus for being overly rigid when it comes to seniority, and their propensity to dole out harsh punishments by way of losing important committee assignments or the loss of floor speaking time if you didn’t toe the company line. He also lamented the Democrats’ proclivity for hazing new members. Freshman representatives were often left to figure out the ways of Washington on their own, often having obstacles thrown in their way when they tried to introduce legislation. 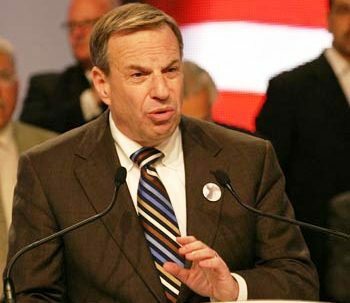 “The leadership does to the Democrats what the Republicans do to us in elections: They divide and conquer,” Filner said. Starbucks CEO Howard Schultz has taken up the cause of the upcoming fiscal cliff. In an effort to encourage Republicans and Democrats to strike a deal and avert the impending fiscal doom, Washington, DC, area Starbucks baristas are writing “come together” on every coffee cup. Schultz wrote in an open letter on the coffee giant’s blog that he was inspired by Americans’ ability to put aside petty differences and come together in times of crisis, such as the aftermath of the Sandy Hook school shootings in Connecticut, in which 26 innocent people lost their lives, including a Starbucks “partner” (that’s how the company refers to its employees), Lauren Rousseau, who had recently become a fulltime teacher at Sandy Hook. It was the outpouring of support for Newtown, CT, that prompted Schultz to launch this latest campaign to encourage lawmakers to sit down and negotiate in good faith for the good of the country. “Rather than be bystanders, we have an opportunity—and I believe a responsibility—to use our company’s scale for good by sending a respectful and optimistic message to our elected officials to come together and reach common ground on this important issue,” Schultz wrote. In his letter, Schultz highlights the “tremendously important, time sensitive issue” of fixing the national debt as the focus of his campaign. And that’s all well and good. The national debt currently stands at approximately $16 trillion and rising, with the budget deficit weighing in at a cool $1 trillion per year (although it has crept downward during the Obama administration). Schultz then points readers to a coalition of business, government, and current and former political leaders calling themselves “Fix the Debt” to find out more about what you can do to help…ahem….fix the debt. Fix the Debt consists of members of both political parties, including NYC Mayor Michael Bloomberg, former Pennsylvania Governor Ed Rendell, former New Hampshire Senator Judd Gregg, and Alan Simpson and Erskine Bowles of the Erskine-Bowles Commission on Fiscal Responsibility. Include comprehensive and pro-growth tax reform, which broadens the base, lowers rates, raises revenues, and reduces the deficit. That’s a nice sentiment, but it really depends on what the methodologies toward those ends are. “Obamacare” already put significant reforms into Medicare and Medicaid that are projected to save $1 trillion over the next decade. But that’s certainly not good enough for Republicans, who would much rather see those “entitlement” programs dismantled altogether. And the cost saving measures, even though many of them were originally Republican ideas, have been rejected by Republicans simply because Democrats agreed to them. A reduction of benefits in Social Security and Medicare is a non-starter for most Democrats, and since that’s the primary goal of Republicans, we have an impasse. And as for tax rates, as it stands, tax rates are currently at the lowest effective rate since the U.S. shifted to a progressive tax system. “Broadening the base” is often interpreted as increasing the burden on the middle class while letting the wealthiest two percent off the hook. And most economic experts agree that putting more of the burden on middle and poorer class families would be catastrophic for the economy. …the plain fact of it is that the two political parties have not been equivalent when it comes to brinkmanship and willingness to compromise; the Republican Party and its constituents have come to consider compromise as inherently a bad thing. Perhaps pretending otherwise and urging everyone to “come together” is the best remedy for that, but I suspect a better one would be to point out exactly who is responsible, even if it means taking sides. The Democrats have offered a series of compromises. The Democrats are willing to discuss reasonable reforms to Medicare and Social Security. In fact, they’ve already acted on Medicare via “Obamacare.” Obama a couple of weeks ago even extended an offer to raise the tax threshold to $400k instead of $250k, and to use chained CPI to calculate cost of living adjustments in Social Security benefit payments, which would effectively reduce the benefits. Some Democrats have even expressed an openness to exploring raising the retirement age from 65 to 67—an idea that has infuriated he more liberal wing of the Democratic Party. They refuse to accept any deal that raises the debt ceiling. The Tea Party fringe controls the Republican Party, and there is no negotiating with the Tea Party fringe. They mostly come from gerrymandered safe seats and feel no threat of losing their jobs. They don’t have to listen to public opinion, even when it’s overwhelmingly against them. They have their rigid ideology. In their minds they were sent to Washington to dismantle the federal government, that doggone it that’s what they’re bound and determined to do (except for the military, of course, which they would love to see grow ten fold). So while Howard Schultz and Starbucks’ campaign is noble, they don’t even begin to acknowledge the real problems plaguing Washington these days. 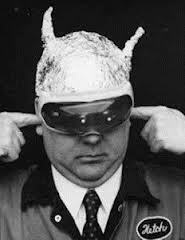 It’s a massive government conspiracy to aid the passage of the UN Arms Trade Treaty! So declares a column published on the wingnuttiest of the wingnut sites, the World Net Daily. In his column, Bradlee Dean insists that the Newtown, CT, and Aurora, CO, shootings were fortuitously staged, that the “timing is impeccable” to coincide with negotiations on the UN small arms treaty, which Dean claims would ban the sale and ownership of all semi-automatic weapons. It does no such thing. The treaty seeks to place stronger regulations on the international arms trade, but it leaves individual nations’ sovereignty alone with regards to the ability to own firearms within that nation’s borders. But let’s not let the facts get in the way of an incredible fantasy. After all, Obama is on a crusade to lock up all conservative Republicans for being conservative Republicans in an effort to assume the role of Supreme Dictator of the World! Right? Despite losing $2.5 million last year, one of San Diego’s municipal golf courses is about to get a makeover. The city posted a request for proposal on its website Dec. 20, calling for a new California Ranch style clubhouse that compliments the existing historical clubhouse. In this writer’s opinion, it’s tragic that the Balboa Park course is in such dire financial straits. I’m not exactly an avid golfer or golf expert, but it’s hard to imagine getting a better value for the golfing dollar than what you get at Balboa. It’s a great 18 hole course, with long par fives and challenging par threes. It has a very unique terrain built into Florida Canyon, with two holes presenting the challenge of rather steep inclines. And the 17th hole is quite possibly the most unique of all: The tee boxes are essentially on top of a cliff, with the green far below. It’s beautiful and challenging at the same time, with golfers being challenged to essentially hit the ball straight up into the air without overshooting the green. I understand that Torrey Pines is THE municipal golf course to beat all others—it also happens to be the only public golf course in San Diego that makes a profit–but not everyone can play Torrey Pines all of the time. 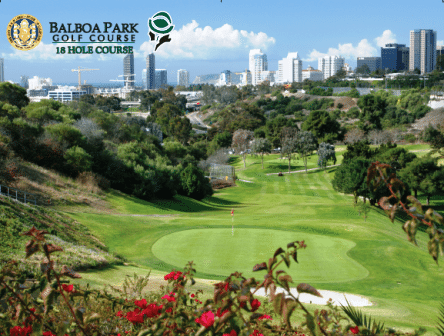 And if you live in the city of San Diego, Balboa is a fantastic deal: A standard weekday green fee of $32 ($40 for weekends) for city residents (as long as you have a resident golf card, which will cost you $25 per year). The Balboa course is one of those unknown, underrated gems. It’s good that it’s being upgraded. I play the Balboa 9 – once a week for the last 9 years. With a resident card it’s $14 to walk it. The Balboa 18 can be walked – if you’re in shape. It is a challenging and reasonably well respected course. The 18 was closed for many weeks this year. Losing that revenue and the need to balance accounts could be why they booked a loss.